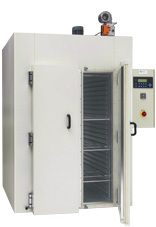 Temperature-conditioned storage in the clean room for storage under controlled climatic conditions, integration and supervision of agitators, possible including direct filling with Triclamp connections directly out of the unit. 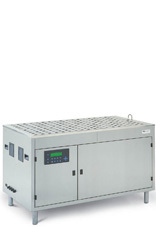 Premium Line P210 – P1700 in stainless steel with water cooling or water-cooled refrigerating machine for avoidance of air movement in the clean room. 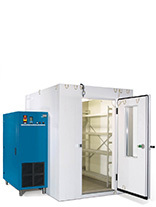 Installation frame for integration of the equipment in the clean room panel. Individual equipment with tubing and Triclamp connections, racks for batching tanks etc. 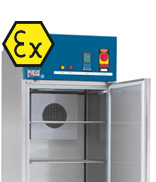 For examination of the effect on the quality of an agent or finished pharmaceutical product during the course of time under the influence of temperature, humidity and light. This serves for determination of the maximum usability period. For examination of the effect on the quality of an agent or finished pharmaceutical product during the course of time under the influence of minimum light doses in the UV and in the VIS range. The lamp emission spectrum should be as similar as possible to the sunlight spectrum. 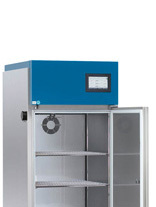 For examination of the quality behaviour of a cream under the effect of high and low temperatures in daily change under extreme conditions, such as during the transport. 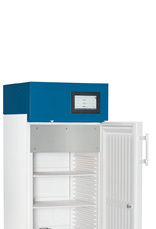 For storage under controlled climatic conditions, integration and supervision of agitators, possible including direct filling with Triclamp connections directly out of the unit.